As we prepared to make the leap into 2017, social media platforms were really shaking it up for the final month of the year. There were new features galore, with many focusing on video. Find out all the latest updates in the world of social media during December. In our November roundup, we told you that Instagram (who have now reached 600m users) planned to launch their own live video feature to compete with the likes of Facebook Live and Periscope. This was formally rolled out in the US in December, but it has yet to reach the UK. 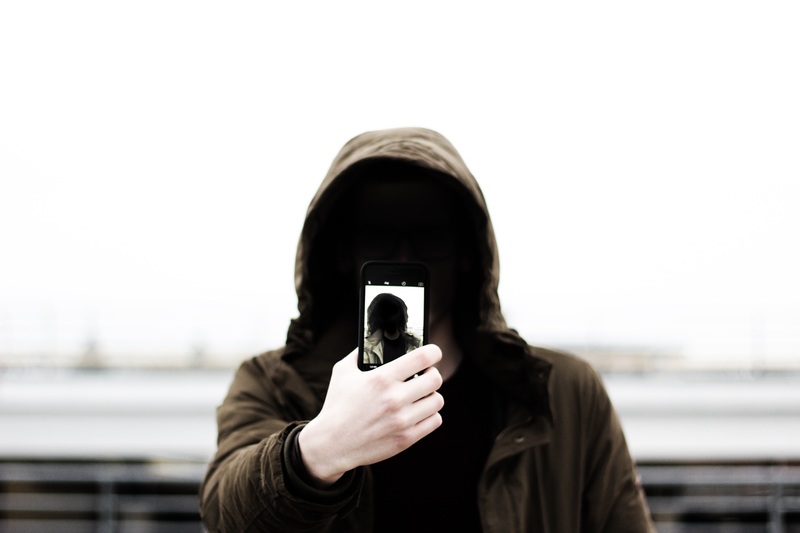 Instagram’s version of live video is truly ‘live’ – the video disappears after the broadcast ends, without the user being given the option to save the video for future viewing as they are when using Facebook Live. You can find out more about how Instagram Live works here. Another feature making its debut is hands-free video. Unlike normal video on Instagram and Snapchat, you only have to touch the middle button once to start recording, without having to keep holding it down. This leaves your hands free to play an instrument, sketch a picture or do whatever you think is entertaining! You can access the hands-free mode by entering Story mode and selecting ‘Hands-Free’. Enjoy getting creative! 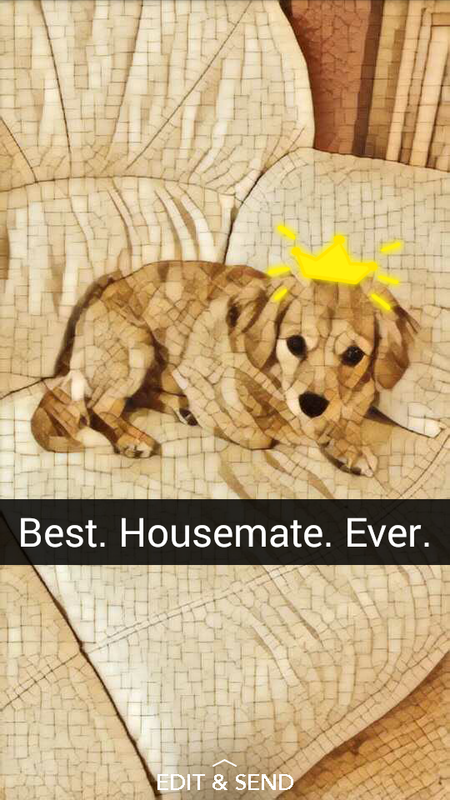 One further development to report – Instagram have introduced Snapchat-esque stickers to Story mode. You can now add stickers to your photos and videos, including stickers which show your location, the weather forecast or the time. At Christmas, there were also seasonal stickers. 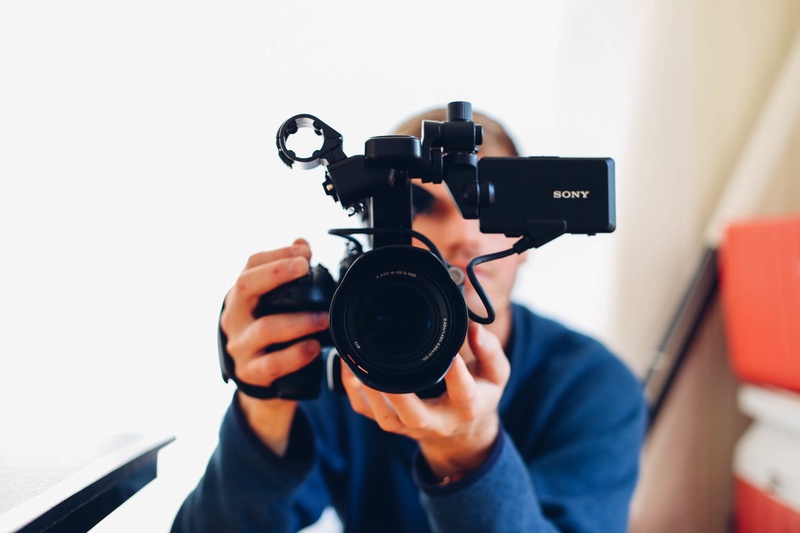 Mark Zuckerberg has been very vocal about his enthusiasm for live video, and has focused on making Facebook a market leader when it comes to users taking advantage of the format. From introducing video calling in Messenger in 2015 to rolling out Facebook live to all users last April, it’s clear that Facebook believe live video is the future. While it is already possible to view 360 video on Facebook, it hasn’t been possible to actually film in 360 using Facebook Live. Until now. Facebook teamed up with National Geographic in mid-December to film a live 360 video exploring the possibility of making Mars a habitable planet. With over 2.5m views, it was a huge success. Rollout to selected pages began in December, while the Live 360 feature will be rolled out to all users during 2017. For users who don’t like being in front of the camera, Facebook has a new feature for you: Live Audio. This allows you to record live, audio-only content, perfect for anyone who is interested in podcasting or radio presenting. Broadcasters such as BBC World Service and LBC have already been chosen to test Live Audio, and the feature should be extended to more users early this year. If you’re the type who enjoys the written word, there’s a fun update for you, too. You may have noticed that when you start writing a status, a number of coloured bubbles show up underneath the text box. 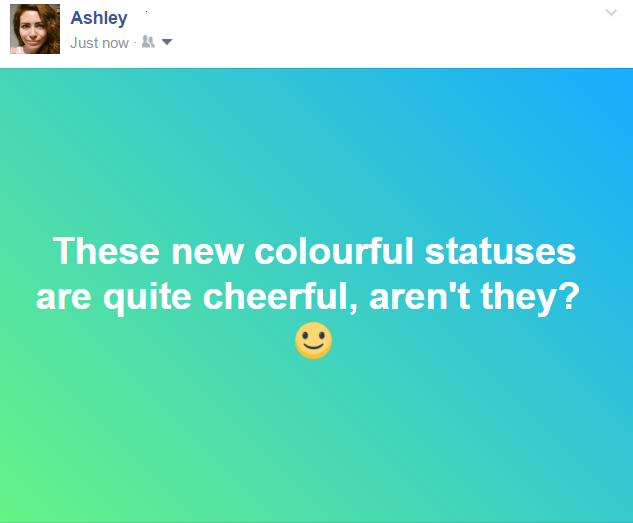 If you click on a colour, the background of your status will change to that colour, with the text in white. This really helps your status to stand out amongst the crowd and brings a nice pop of colour to your newsfeed. This feature is currently only available to Android users, but is visible on all devices. It’s been another busy month for Snapchat, with the introduction of even more features. First up: Groups. 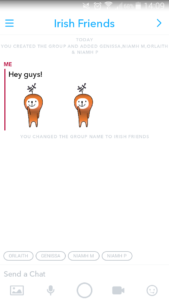 You can now add up to 16 of your Snapchat friends to create a single group chat. 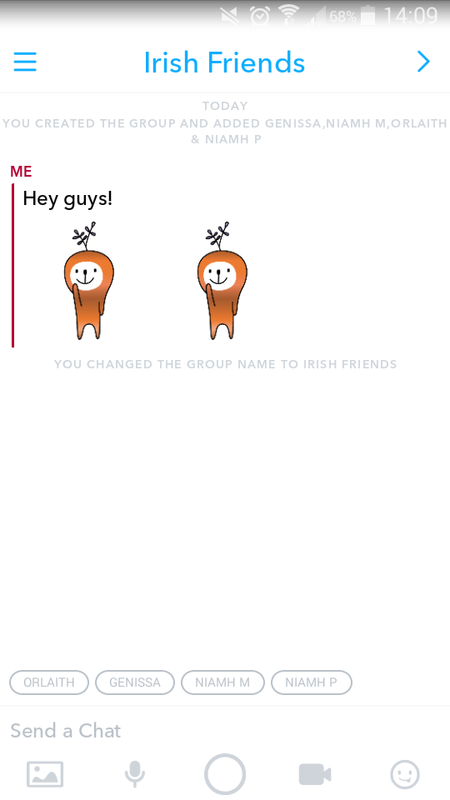 Like a regular Snapchat message, you can add stickers, photos, Bitmoji, video and voice notes to the conversation. December also saw the introduction of Scissors, a creative tool which allows you to ‘cut out’ parts of your snap to make your own stickers. Just click on the scissors icon and then draw an outline around the part of your picture that you want to use. The Paintbrush tool is a fun new addition to the app as well. Simply go into Memories, select the edit option and click on the paintbrush on the top left corner of the screen. You will then be presented with a number of filters, some of which are in the style of famous artists like Van Gogh. Click the filter you want and watch your photo transform into a masterpiece! In December, Snapchat announced that Shazam was being integrated into the app. If you hear a song that you don’t recognise, you can now press and hold the camera screen and Snapchat will link to Shazam and give you the details of the song. This is particularly useful when you’re out and about and hear a new song that you love, or when you’re at a festival and you stumble upon a new band. Twitter have followed in the footsteps of Facebook and have finally added an integrated live video function to the app. Previously, users had to have a Periscope account in order to broadcast live footage on Twitter. Now, you can click on the ‘compose tweet’ button, navigate to the camera function and then select ‘Live’. As in Periscope, users can send hearts and comment on your video, which will be posted as a tweet. Twitter have also introduced 360 video. At the moment, only selected users can film in 360 using the app, but all users can view these videos. One of the funniest (and most useful!) 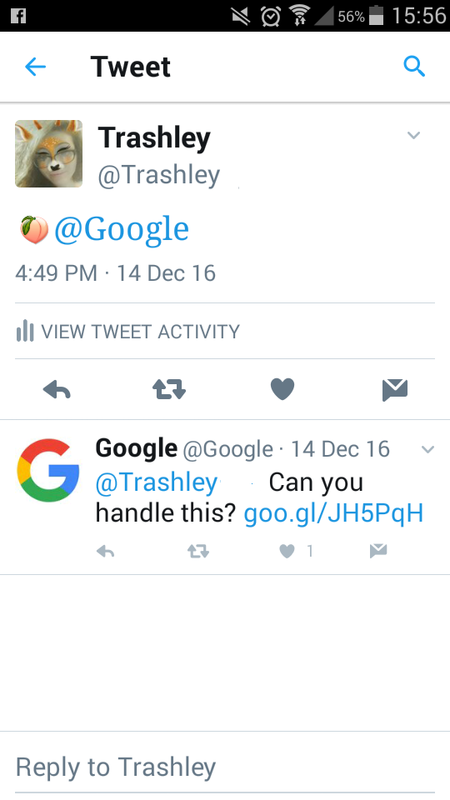 updates of December was the discovery that if you tweet certain emojis to the official Google twitter account, they will send an amusing or useful reply. For example, if you tweet a burger emoji to Google, they will reply with the search result for ‘burgers nearby’, and if you send them a peach emoji they will respond with a link to the song ‘Bootylicious’ by Destiny’s Child. Have you tried tweeting Google an emoji yet? If you did, what was their response?